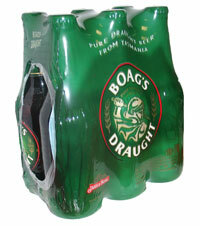 Boag's Draught is a much loved Australian style beer. Using the finest quality hops and malts that Tasmania has to offer, the Boags brewery have produced a lager that combines a bitter, hoppy, fullness of flavour with a crisp, refreshing finish. This old classic is sure to please.